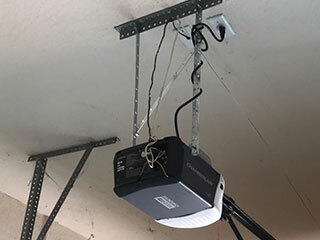 Home Our Garage Door Services Garage Door Openers Which Opener Drive Type Is Right For You? A new opener is an excellent way to upgrade your home’s garage door system. You stand to benefit from a smoother, quieter and more reliable system, as well as one that improves the overall safety, security and convenience of your home. However, it can be difficult to know exactly where to start. There are so many options available, that many homeowners struggle to choose the perfect unit for their needs. The most important difference between many types of opener is the drive system they use - this should be the first decision you make, so we’ll discuss what each drive type is suitable for, and why you might choose it. A chain drive opener uses a long metal chain, much like you’d find on a bicycle, to move the door up and down. Systems like this have been used for many years, and are found in many homes throughout America. They’re durable and reliable, and they’re usually the most affordable type of drive on the market. The drawback to chain drives is that they’re noisy; you’ll certainly know when the door is opening or closing. Some homeowners view this as a side benefit, since it alerts people to the door’s movement, but others may well find it disruptive. Often referred to as the “Cadillac of garage door openers”, belt drive systems are extremely smooth and quiet. They achieve this by swapping out the metal chain for a rubber or fiberglass belt, reducing noise significantly. These units are more expensive, but they provide a much more comfortable level of noise - vital if there’s a bedroom above the garage. A third type of opener gets rid of the belt and chain altogether, using a long threaded pole to move the door. These types of drive are typically a little louder than belt drives, but they require very little maintenance. The screw system is very robust and only requires occasional lubrication - perfect for homeowners who don’t want to spend a lot of time in the garage. Deciding on the perfect opener for your home starts here; for more information and guidance, just contact our team of expert technicians!